Water Heater Installation - Water Heaters Only Inc.
Water Heaters Only Inc has been specializing in water heater installation since 1968. 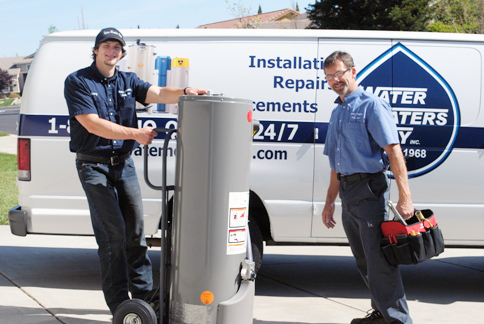 We install a variety of models and types of water heaters in the greater Sacramento Area. We have over 50 years experience installing water heaters and over 500,000 satisfied customers since 1968. When installing a new water heater, we comply with all local building and plumbing codes. This can include adding or upgrading earthquake strapping and bracing for water heaters. Installing a new gas shut off valve and adding a sediment drip leg. Ensuring that the vent is the correct material and drafting properly. When our technician comes to the home to estimate the water heater installation, they will review all the items needed to properly install the new water heater to code and review the permitting process, prior to beginning any work. Only when the estimate has been approved, will we begin work to replace the water heater. Below is a list of the most common types of water heaters we install and some of our recommended brands. At Water Heaters Only Inc we understand that a quick response and competitive pricing are important when having a new water heater installation. It’s one reason, we offer same day service, quality products and we will beat any competitors onsite bid for a similar quality installation. Generally residential water heaters have a life expectancy of 8-12 years, once a water heater has failed, it will leak and stop producing hot water. Sometimes water heaters will stop working when a pilot light goes out or if a part malfunctions. In these cases it might be possible for a water heater repair instead of having to install a new unit. Read more about water heater repairs or some common water heater problems. If you have a water heater with a re-circulation pump, we can check that the pump is working correctly and re-install the existing pump or replace the re-circulation pump if needed during your water heater installation. If you are having water heater problems call 24 hours a day 1-916-448-2113 to speak with one of our water heater experts for help or to schedule an appointment for service.